I just had the best lunch today, for a Dane who's been craving some of her comfort foods, that is. I took a trip to the 'Big City' yesterday with a friend and we checked out a food store that was new to both of us. It's called Earth Fare and I got a little carried away in there. Actually in retrospect, I really, really, really restrained myself. Of course that's because I knew I had a pretty full fridge at home to begin with. This store has a lot of locally sourced organic fruits and vegetables, and quite frankly some of the best looking produce I've seen in a long time. However to get back to my lunch. They actually had some Tilsit Cheese and some wonderful Mushroom and Pork Pate. 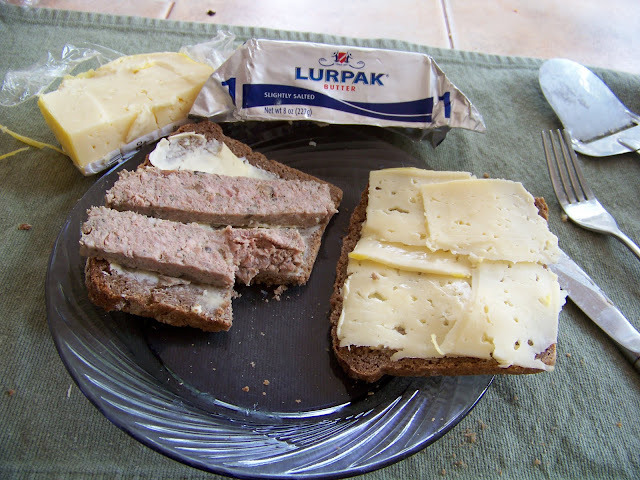 So I took my Lurpak butter out of the fridge, put a nice thin layer on some of the last of the Rye Bread I had, and then added my Pate to one slice and the Tilsit to the other, and had a wonderful lunch. The only thing that could have made the meal better would have been to have a nice Sild and some Snaps and a beer. But I still have to do some work today, so I couldn't indulge myself that way. I will be going back there the next time I'm in the big city. I was able to find some reasonably priced beef there as well, all antibiotic free. I also picked up some Irish Banger Sausages that I'm going to cook for breakfast or dinner tomorrow, if they end up as dinner, then I'll make some mashed potato's so we can have Bangers and Mash for dinner. I also picked up some Andouille, Chorizo and Italian sausage that await their turn for dinner either as part of a whole or by themselves. I think I see some lovely Jambalaya in our future, and a nice Lasagna and can't forget the Chorizo, which will also make a wonderful breakfast, with some fluffy scrambled eggs, and salsa tucked into a nice flour tortilla. Gee, I think I'm getting inspired here, at any rate, I'll let you know what else I come up with.